When you are in the wrestling business, anything can happen. It is one of the most unpredictable businesses, and sometimes even those who have been working in it for years can be taken by surprise by something that can happen. Bruce Prichard had such an experience which ended up taking him by complete shock, and he talked about it on the Something to Wrestle With Bruce Prichard podcast (H/T Ringside News). When he had gotten into an Uber, the last thing that he had expected was to be greeted by a person claiming to be the WWE Legend, Undertaker's son, but according to him, that's exactly what happened to him. 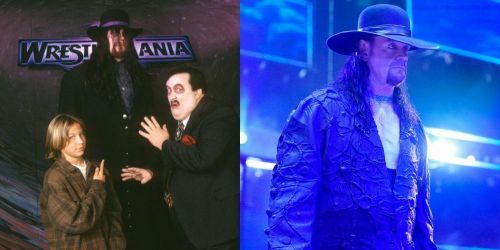 Bruce Prichard was a huge part of WWE's history, and at one point in time during the early 90's he had even been the manager of the Undertaker as the controversial 'Brother Love' character. He would return to the WWE later and remain as a backstage personality helping with the booking and decision making. While in this role he still made several appearances on-screen as Brother Love, often in the same segment as the Undertaker. Being a veteran of the wrestling business, Prichard has more than some contact with the Dead Man. On the podcast, Prichard talked about the time that he got into an Uber and his driver reportedly tried to convince him that he was Undertaker's son. Prichard mentioned that the driver did not recognize him or know about his podcast, but when he mentioned that he was connected to the wrestling business, the driver said that his real father was the Undertaker. Prichard confessed that he was confused when he first heard this, given his familiarity with the Undertaker in real life, and knowing the Phenom's children. The guy went on to explain that during the days of Studio 54 and Andy Warhol, his mother used to work there, and the Undertaker hung around there during that period. While Prichard was still trying to absorb this news, the driver went on to say that the reason he knew this was because his father was the Undertaker's 'brother', Kane's friend. He explained the Undertaker and Kane did not get along and had not done so since the two of them had been children. While the Undertaker and Kane were brothers in storyline, in real life, Mark Calloway and Glenn Jacobs were definitely not siblings. During the whole time, Prichard confessed that he was pretending to go along with the driver's story while texting the Phenom, who was more than surprised to hear that his 'son' was driving Prichard around. Prichard ended up mentioning that the driver looked more like Mark Henry than The Undertaker, but he didn't try to dispute his story. The Undertaker is a legend of the business, and given that wrestling has enough storyline sons right now, it is unlikely that the driver was actually Undertaker's real-life son, although he might have believed it himself. Prichard's story just goes to show yet again, how unpredictable the WWE and wrestling business can be. Meanwhile, the Undertaker is set to appear on the Super Show-Down at Melbourne on the 6th of October, where he will take on Triple H.
What do you think of Undertaker's 'son' giving Bruce Prichard an Uber ride?